A number of years ago I realized that, whenever a recipe called for buttermilk, I never knew what to do with what was left over. I would invariably leave it in the fridge till I determined it was “bad” (even though buttermilk always looks “bad” to me…) and throw it away. I finally decided to try and find a buttermilk cake recipe that would not be too labor-intensive, freeze well and be a great “go-to” for unexpected guests. And of course, I found it here. If you’re unfamiliar with Ms. Beranbaum or her AMAZING cookbooks – get to know them!! Her recipes are the most foolproof I’ve ever followed and consistently get the biggest raves. This is a great cake to start with – delicate, moist and flavorful. I’ve doubled the original recipe because it’s that easy and freezes beautifully but feel free to halve the ingredients if you like. 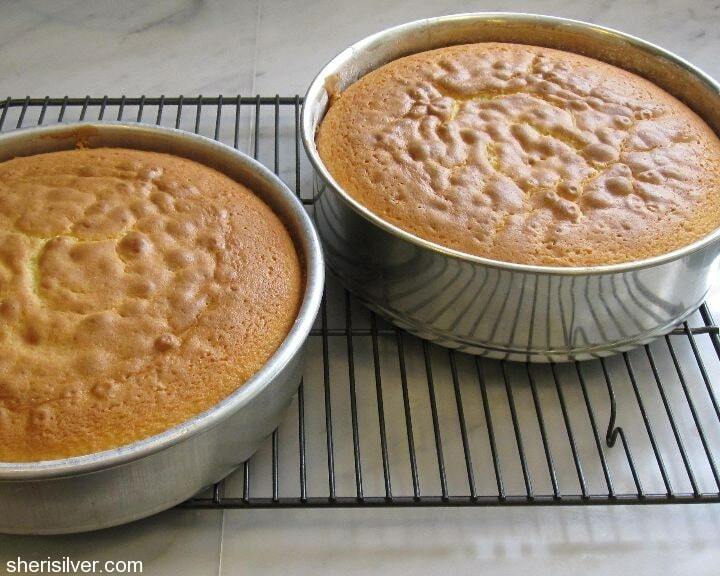 Prepare 2 cake pans that are 9 x 2 or 9 x 3 (a springform pan works well). Place all dry ingredients in your mixer bowl. In another bowl lightly whisk egg yolks – add 1/3 c. buttermilk and vanilla and continue whisking till just combined. Mix dry ingredients on low for a minute – add all of the butter and the remaining 1 c. buttermilk. Mix on low till dry ingredients are moistened, then increase speed to medium for 2 minutes. Scrape down the sides. Add egg mixture in 3 batches, beating for 30 seconds after each addition. Scrape down the sides. Divide batter evenly between prepared pans and smooth the tops with an offset spatula – bake for 30-40 minutes or till a tester comes out clean. Cool cakes in pans on cooling racks for 10 minutes – remove cakes from pans and continue cooling on racks. Serve dusted with confectioner’s sugar or wrap and freeze for up to 2 months. *read this for what to do with those leftover egg whites!